New Custom Swizzle Sticks At Lowell's Restaurant & Bar In Seattle! Lowell's Restaurant & Bar in Seattle is one of our newest customers and we are excited for the opportunity to work with them on a flashy new custom swizzle stick design! 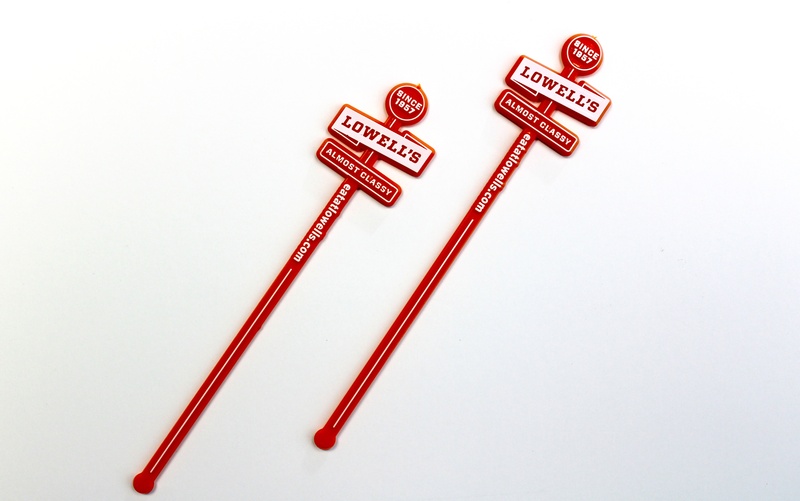 Along with their logo, Lowell's personalized stirrers feature the founding date, 1957, along with the slogan, "Almost Classy," with the website URL down the shank. Molded in vibrant orange and stamped in bright white, these swizzle sticks are sure to be a keepsake for visitors to Lowell's, one of the Emerald City's most historic spots to dine and drink. Learn more about Lowell's by following this link. Cheers! Custom Picks Top Off Cracker Barrel's New Cast Iron Pressed Burgers! Chicago Area Tiki Tour Swizzle Sticks Are In Action This Week!